Wrangler a bit plain? Set it apart from the rest with this rugged-looking ten (10) piece Override Body Side Graphic Kit! Kit is PRECUT and ready to install in one of six (6) unique color combinations - NO TRIMMING required! 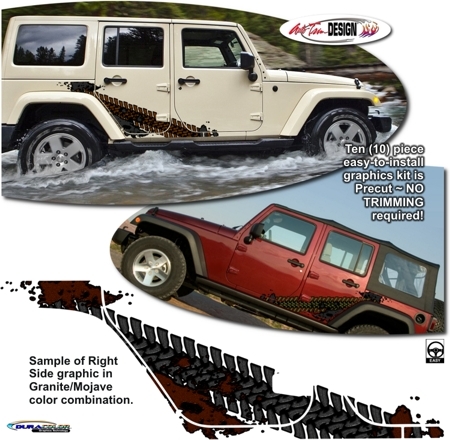 With it's distinct tire tread and splash design, graphic package is not a generic "one-size-fits-all" decal in a box. Our graphic kit consists of prefitted and contoured pieces as shown in the illustration. Kit is specifically made for the '07-'17 Jeep Wrangler Unlimited Four (4) Door and will not fit any other vehicle. Graphic kit is vehicle specific and will not fit any other model.